From Augustine's Tractates on John: Tractate XLV (Chapter 10:1-10). "The Office of Preaching, and of Preachers and Hearers," Martin Luther, c. 1522. "Seeing that by Christ alone we have access to the Father, there are no true shepherds other than those who come to Christ themselves and bring others there also, neither is any to be thought to be in the true sheepfold but those who are gathered to Christ." "The great Shepherd of the sheep knows all that are his, guards them by his providence, guides them by his Spirit and word, and goes before them, as the Eastern shepherds went before their sheep, to set them in the way of his steps." "And as it is not unworthy of Christ to be styled the door, by which both the sheep and the true pastor enter, so neither is it unworthy of God the Father to be styled the door keeper." "Christ is at once the door, the shepherd and the pasture. His pasture is the bread of life and the water of life." Commentary, John 10:1-10, (Easter 4A), Elisabeth Johnson , Preaching This Week, WorkingPreacher.org, 2017. "Easter and the Bandit Shepherd," Nancy Rockwell, The Bite in the Apple, 2017. "How to Love Like a Mother," Rev. Anne Howard, ON Scripture, Odyssey Networks, 2014. "Abundant Life Now," David Lose, Dear Working Preacher, 2014. "Figurating Speech with a Twist," D Mark Davis, Left Behind and Loving It, 2014. "God Loves Us Dirty Sheep," Mike Baughman, 2014. "The Good Shepherd," Nancy Rockwell, The Bite in the Apple, 2014 . Concise Exegesis, Richard Donovan, Lectionary.org. The Lectionary Lab,, the Rev'ds Dr. John Fairless and Delmer Chilton (aka "Two Bubbas and a Bible"), 2014. Lectionary Lab Live podcast. "Pasture," Andrew King, A Poetic Kind of Place, 2014. "The Gate," Andrew Prior, First Impressions, 2014. "Finding the Gate," Christopher Burkett, Preacher Rhetorica, 2014. In this continuation of Jesus’ giving sight to the man born blind, Jesus claims that he is the shepherd whom the sheep trust, and that he is the gate itself keeping the sheep safe. Erin Gruwell in Freedom Writers is a teacher who looks upon her students as her flock to guide and protect, as well as introducing them to the wondrous world of books —and who makes an enormous sacrifice for them. Ed Mc Nulty, Visual Parables. "The Gate for the Sheep," Janet H. Hunt, Dancing with the Word, 2014. Evangelio Comentario del San Juan 10:1-10 por Ismael León, Working Preacher, 2014. Commentary, Mark G. Vitalis Hoffman, Working Preacher, 2014. "Good Shepherd" podcast, Rolf Jacobson, Craig Koester and Kathryn Schifferdecker, Working Preacher, 2014. Commentary, John 10:1-10, (Easter 4A), Sarah Henrich , Preaching This Week, WorkingPreacher.org, 2011. "One lesson here is that sheep fare best together, not picked off one by one. Another is that there is promise of great pasturage, abundant life for all who follow Jesus' way. A third is that there is something public, open, honest, and even simple about how we live as God's people through Jesus." Jesus the Good Shepherd, audio telling, story in episodes, graphic, audio and written commentaries. Go Tell Communications, Biblical Storytelling for the Global Village, 2011. Enter, Fr. Rick Moley, a garden path, 2011. "But, what Jesus says is that he’s not here to lead us into constraint...he’s here to lead us out!" "Abundant Life," David Lose, WorkingPreacher, 2011. "Jesus the Gate, and Paddy Plenty," Peter Woods, I am Listening, 2011. "What a gift! To be able to see abundance when scarcity is screaming for attention." A Radical Love, Neil Chappell, aweirdthing, 2011. "Radical love. Loving the unlovely. Serving the ungrateful. Compassion for the corrupt. Welcoming the outcast. Radical love. God’s been there, done that and got the t-shirt. This is the Good Shepherd." Lectionary Blogging, Easter 4, John Petty, Progressive Involvement, 2011. "In this story, the 'ticket' required by the gatekeeper--the only requirement--is the death and resurrection of Jesus." "Jesus the Good Shepherd," Edgy Exegesis, Alyce McKenzie, Patheos, 2011. "John's Gospel always addresses readers in the plural. These texts were meant to be read aloud in group worship." Holy Textures, John 10:1-10, Understanding the Bible in its own time and in ours, David Ewart, 2011. "The ambiguity of phone as "sound" or "voice" may be intentional. Somewhere I remember hearing that each shepherd had a special whistle or sound that called his own sheep..."
"First Thoughts on Year A Gospel Passages in the Lectionary: Easter 4," William Loader, Murdoch University, Uniting Church in Australia. "God?s being in love, in relationship, is the source and pattern for a vision which might include all in such unity. Globalised, it engages us in a vision which embraces diversity and difference, but has no place for exploitation and marginalisation." A Voice Calling My Name, Andrew Prior, First Impresssions, 2011. "If I want that voice calling my name— I think that is what I am hearing— if I want that voice calling my name to be clear and certain and comforting, I must leave what little comfort I have, and follow the shepherd out into new pastures." "But Can You Trust Him?" Russell Rathbun, The Hardest Question, 2011.
" What do I do when my experience contradicts what Jesus says? Commentary, John 10:1-10, Jaime Clark-Soles, Preaching This Week, WorkingPreacher.org, 2008. Dylan's Lectionary Blog, Easter 4A. Biblical Scholar Sarah Dylan Breuer looks at readings for the coming Sunday in the lectionary of the Episcopal Church. "It may be costly to confess Jesus as Lord, but there are two ways to that confession which are implicit in this Sunday's gospel." Gospel Analysis, Pastor Edward Markquart, Sermons from Seattle, Grace Lutheran Church, Seattle, Washington. Detailed background and exegesis. "This is the primary mark of a good shepherd. He is willing to die that the sheep might live. That is what the story of the cross is all about." "Flocking Together," Edgardo Antonio Colón-Emeric, The Christian Century, 2005. "Where is this flock? Wherever there are sheep walking with the Good Shepherd in the way of love." Wellspring of the Gospel, Easter 4, 2005. Catherine McElhinney and Kathryn Turner, Weekly Wellsprings. "How would you explain this Gospel to a child - or someone new to Faith?" Andrews, Susan, "At Home in God," The Christian Century, 1999. Brame, Grace Adolphsen, "The Cross: Payment or Gift?" Perspectives in Religious Studies, 2005. Colón-Emeric, Edgardo Antonio, "Flocking Together," The Christian Century, 2005. Foster, Richard J., "Salvation Is for Life," Theology Today, 2004. Golding, Thomas A., "The Imagery of Shepherding in the Bible, Part 1," Bibliotheca Sacra, 2006. Golding, Thomas A., "The Imagery of Shepherding in the Bible, Part 2," Bibliotheca Sacra, 2006. Kysar, Robert, "Johannine Metaphor -- Meaning and Function: A Literary Case Study of John 10:1-8," Semeia, 1991. Long, Kimberly Bracken, "The Shepherd Jesus," Journal for Preachers, 2006. Sermon. Martin, James P., "Expository Article, John 10:1-10," Interpretation, 1978. Marty, Peter W., "The Door to Abundant Life," The Christian Century, 1996. Neyrey, Jerome H., S.J., "'I Am the Door' (John 10:7, 9): Jesus the Broker in the Fourth Gospel" Catholic Biblical Quarterly, 2007. Neyrey, Jerome H., "The 'Noble Shepherd' in John 10: Cultural and Rhetorical Background," Journal of Biblical Literature, 2001. Ramsey, Boniface, "A Note on the Disappearance of the Good Shepherd from Early Christian Art," Harvard Theological Review, 1983. 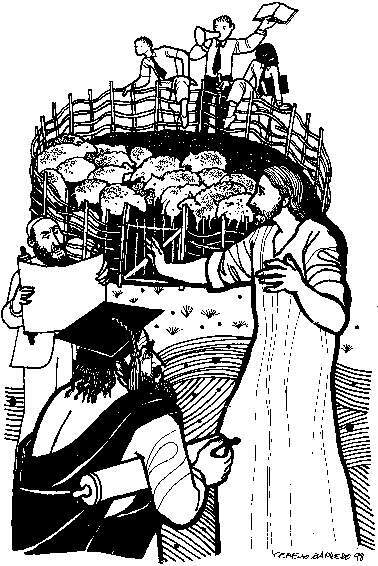 "The Sheepfold," the Rev. Adam Thomas, Day 1, 2011. "Are You Hearing the Bleating, Too?" Easter 4 - 17 April 2005, David Zersen, Göttinger Predigten im Internet: Every Sunday Sermons based on the RCL by a team of Lutheran theologians/ pastors. "Sheepgate," the Rev. Ronald T. Glusenkamp, Day 1, 2002. "Good Shepherd, Columbine High School, Mass Murder"
"The Master's Voice," Charles Kirkpatrick, Sermons4kids.com. "The Good Shepherd," Jim Kerlin, childrensermons.com. "The Good Shepherd," children's study, puzzles, coloring sheet, etc. Higher Praise Christian Center. Crossword on John 9 & 10, Don Crownover's Bible Puzzles. The Shepherd and His Flock Dot-to-Dot, The Sheep and the Shepherd Maze, The Sheep and the Shepherd Word Search, sermons4kids.com. "Good Shepherd, Smart Sheep," Heather Cooper, dramatix. "The Door," John Fewings, dramatix. "Recycled Life," John McNeil, dramatix. "The Great Exchange," Valerie Keefe, dramatix. "The Shepherd and the Wolf," from A Certain Jesus by Jose Ignacio and Maria Lopez Vigil. Ideal for catechetical and liturgical dramatization of today's gospel. Claretian Publications. "Total Boredom," Michael English, Milton Parish Church Drama Resources. Clip Art, John 10:7, Fr. Richard Lonsdale, Resources for Catholic Educators. Clip Art Images: John 10:1-10, Misioneros Del Sagrado Corazón en el Perú. John 10:1-10, at Cerezo Barredo's weekly gospel illustration. Liberation emphasis. ”O Jesus, You Were Born to Be,” original hymn by Carolyn Winfrey Gillette, 2011, Tune: TRURO 8.8.8.8 (“Lift Up Your Heads, Ye Mighty Gates”) and O WALY WALY 8.8.8.8. "Walk on ahead, Good Shepherd," Brenton Prigge, NewHymn, a new, relevant hymn set to traditional tunes. Hymns with Scripture Allusions: John 10:2, 3, 9, 10. The Cyber Hymnal.